During 1991 Enzo Coloni's team hit rock-bottom. The first 13 races with Portuguese journeyman Pedro Chaves (winner of the 1990 British F2 championship) and the last two with Japanese F3 Champion Naoki Hattori brought no luck whatsoever, the team failing to prequalify on all its attempts. Unlucky Chaves is still recorded as the driver who failed to (pre)qualify more times than anyone else without actually taking part in a single GP race. "The other Enzo" had to face it: his C4 was an absolute dog. So, for 1992 he turned his back on F1 and sold his team to wealthy Italian Andrea Sassetti, owner of the Andrea Moda fashion empire. Sassetti ambitiously recruited the once-talented Alex Caffi and Enrico Bertaggia on his driving staff and ordered the design of the all-new Andrea Moda S921. 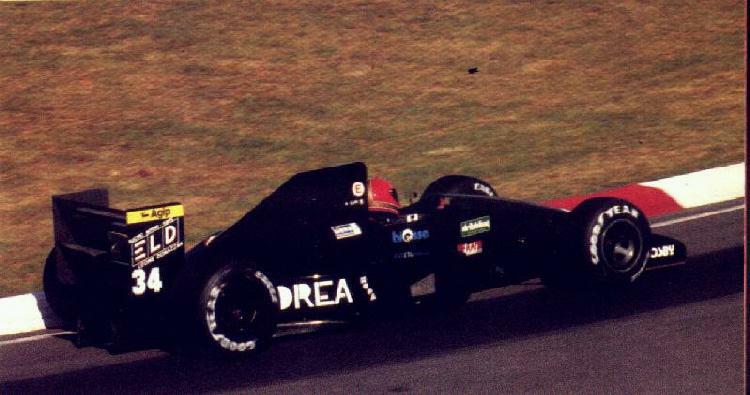 However, the Andrea Moda effort faired even worse then Coloni's the year before. The delivery of two Simtek-penned S921s, again propelled by the underpowered Judd V8, was late which meant that Andrea Moda had to appear in Kyalami with revised Coloni C4s which subsequently failed scrutineering for not passing FIA's compulsory crash test. Brazil was a likewise disaster with the new S921s withdrawn before practice. After that, Caffi and Bertaggia left the sinking ship to see Roberto Moreno and Perry "Pel" McCarthy failing to prequalify at the next couple of events. With the help of supernatural powers, Moreno qualified for Monaco but of course failed to finish. The team pulled the plug after Spa - and no-one really regretted their departure.